Your Day 27 Challenge is to Figure Out the Very Next Thing. The hardest part about having big dreams is figuring out ‘step one.’ We did a lot of work on breaking 10-year dreams down into quarterly goals. 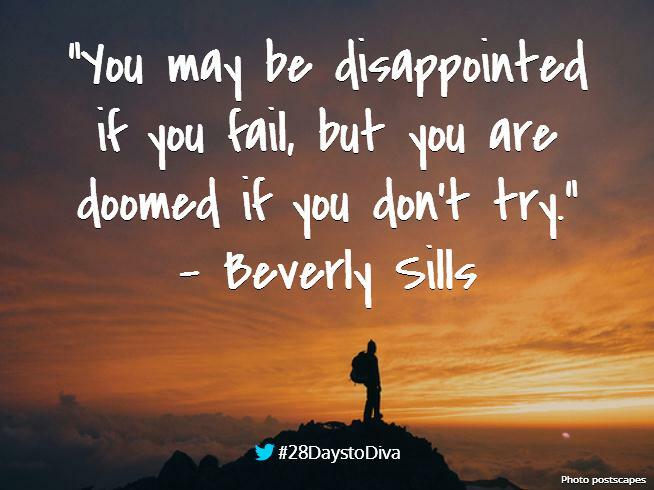 But, here you are on Day 27 and we only have one day left of 28 Days to Diva. You want to plan a recital, get a top-level audition, work with a coach, record a CD, and on and on. A mountain of goals can make you feel just as stuck as when you didn’t know what to do at all. The part that I love most about Ms. McFaul’s quote at the top is, “The response that you get is your information… They will lead you to the next thing.” When we do our timelines and our assessments, we can clearly see the connections that were formed. In the present, that task is much more difficult. For certain personalities, planning is akin to breathing. We plan and we plan and we plan some more. Isn’t it funny though, that no matter what you plan it happens to be those seemingly innocuous connections that spur such great results? That is one of the main reasons I believe it is extremely important to have a mentor on your singing team. Your mentor isn’t your voice teacher, best friend, or parent for good reason. Your mentor has a different perspective. When your mentor says, “have you ever thought about x” pay close attention. In fact, take that suggestions home and mull it over. It could be your next big break. Have you ever heard another singer get honest feedback that they weren’t ready to take in? That advice could be monumental but not if the singer isn’t ready to hear it and act on it. “The response you get is your information.” Prepare yourself to really listen to what other people are telling you. Take action on their suggestions that align with your passion. Develop the thick skin it takes to really listen to the people who have your best interests at heart. You can always decide, “no, that won’t work for me,” after you have weighed the pros and cons. What recent feedback have you been getting? What about that really resonates with you? What is the very next thing that you are going to commit to with passion and make it happen? List all the reasons why you should and will commit to it at this time. Here we are, determining our future in the service of art. The way you choose to live your diva life is up to you. There may be times when you question whether the work is really paying off. Or, there may be times when you are stuck. That is okay as long as you remind yourself to listen to your feedback. Your mentors, audience, and singing team will tell you what comes next. You cannot do this job alone. I can’t do it alone either which is why I truly enjoy connecting with all of you! Many of you have left comments on the various posts and it has made my day every time. I’ve had a chance to connect with so many divas via Twitter (@mezzoihnen) that my heart is about to explode into glitter. If you would like to share in the comments your “very next thing”, I would love to read it! Thanks again for being here.